Number 3 from Hugh. I think I’m actually going to make it my mission this year to make all the recipes from Hugh Fearnley Whittingstall’s Light and Easy. I’ve always wanted to do this and this book seems like the perfect one to do. 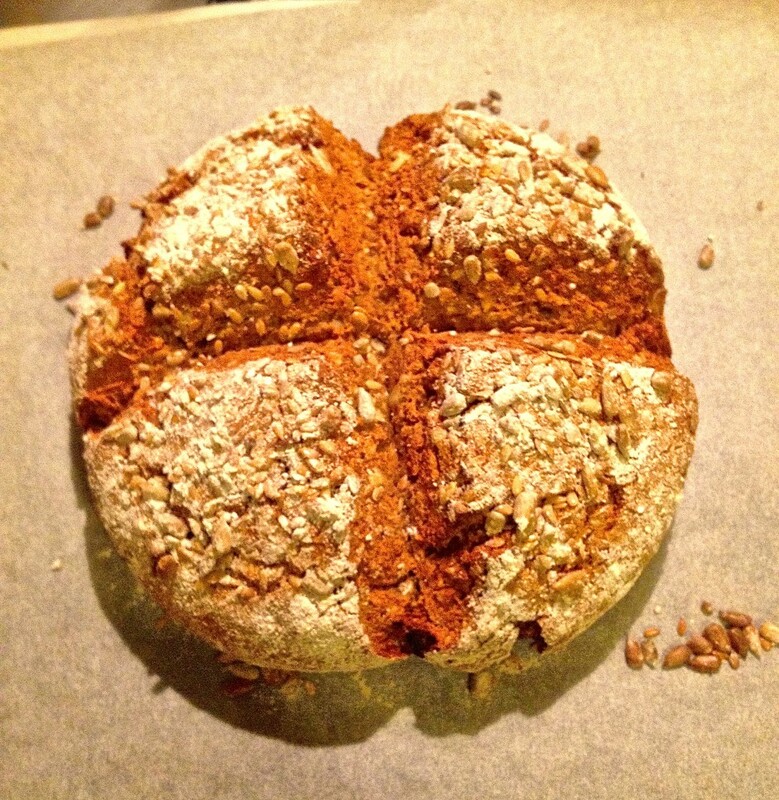 Soda bread is a god send when you need a quick loaf of bread to serve with dinner and really don’t like buying shop bought. This recipe takes 40 minutes from start to finish. Rye is a nuttier flour and I used wholemeal, but it is not gluten-free. Rye and barley all contain the same type of protein as wheat that causes the inflammation in those with coeliac disease. 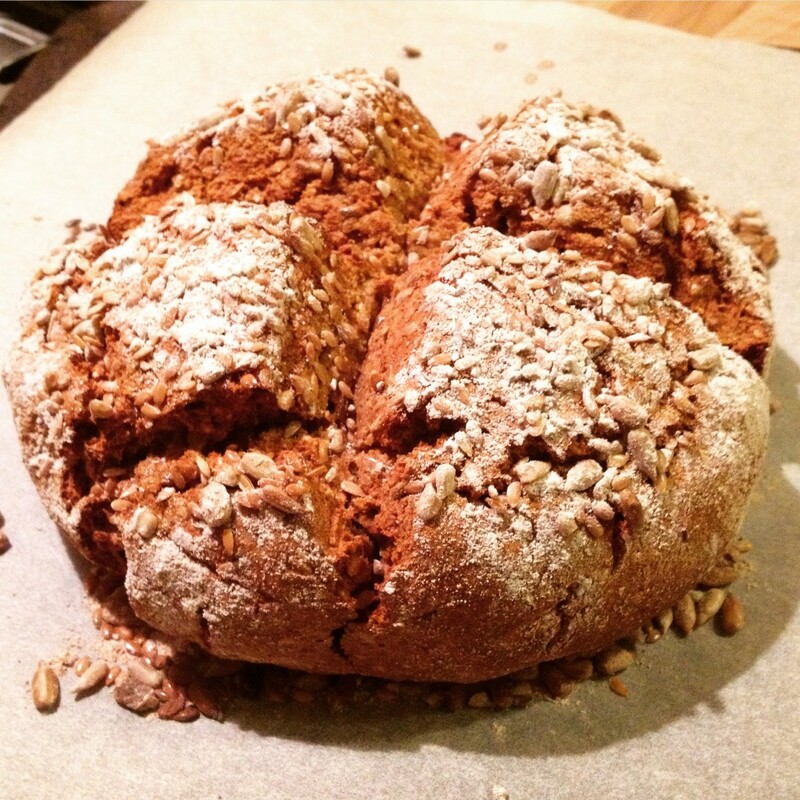 Rye however, makes a lovely change and works well in this soda bread. Preheat your oven to 200C and line a baking tray with greaseproof paper. Set aside one tsp of the seeds to sprinkle on the loaf then combine the rest with the flour, salt and bicarbonate of soda. In a jug, stir together the apple juice, water, honey and oil, until the honey dissolves. Pour the apple juice mixture into the dry ingredients and mix quickly to form a sticky dough. It really is quite sticky so keep plenty of flour to hand. Scrape the dough onto a floured surface and form into a round. I really couldn’t be without my dough scraper when making bread of any kind, mine is from the Hobbs House Bakery. They’re cheap and I’m sure you can pick them up in places like John Lewis and Lakeland. ANYWAY, back to the bread. Transfer the shaped dough onto your lined baking tray and sprinkle with the reserved seeds. Dust with some more rye flour and cut a deep cross in the dough – you can also use your dough scraper for this, see, so handy! Bake for 30 minutes until wonderfully browned all over. Best straight out the oven with butter (oops I mean olive oil). Keeps well for a couple of days for dipping into soup, try some spiced ones this winter, or accompanying a salad. Posted in Recipes and tagged bread, dairy free, lunch, rye, salad, seeds, soup, wheat free.